We constantly monitor prices to insure you receive the best value. When you are comparing our prices with other sellers please make sure you are checking the total price (price of the item, shipping costs, sales tax, etc) order processing time and customer feedback. We would be very surprised if you find a total price lower than ours. In the event you do please let us know and we'll attempt to match it at the time of purchase. Product must be the identical “new” model from an authorized U.S. distributor. Product must have same U.S. manufacturer's warranty, model number and contain the same content and components. Competitor/seller must have the exact brand and model available for purchase and delivery (out of stock or back ordered items are not eligible for price match). BESTBLANKS.com may verify competitors product, availability and price before issuing a price match. BESTBLANKS.com does not match private sellers, auction websites, refurbished, used or clearance items due to discontinued or damaged product. 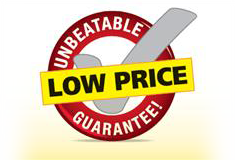 Our Low Price Guarantee does not apply to obvious pricing errors or clearance/close-out items. Our Low Price Guarantee applies to the total purchase price of the item. Total purchase price includes shipping, taxes or other discounts or promotions (if applicable).